An act to amend and supplement the Federal Aid Road Act approved July 11, 1916, to authorize appropriations for continuing the construction of highways; to amend the Internal Revenue Code of 1954 to provide additional revenue from taxes on motor fuel, tires, and trucks and buses; and for other purposes. The Federal-Aid Highway Act of 1956, popularly known as the National Interstate and Defense Highways Act (Public Law 84-627), was enacted on June 29, 1956, when President Dwight D. Eisenhower signed the bill into law. With an original authorization of US$25 billion for the construction of 41,000 miles (66,000 km) of the Interstate Highway System supposedly over a 10-year period, it was the largest public works project in American history through that time. The addition of the term "defense" in the act's title was for two reasons: First, some of the original cost was diverted from defense funds. Secondly, most U.S. Air Force bases have a direct link to the system. The purpose was to provide access in order to defend them during an attack. All of these links were in the original plans, although some, such as Wright Patterson were not connected up in the 1950s, but only somewhat later. 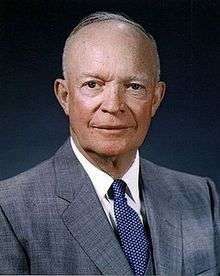 U.S. President Dwight D. Eisenhower. Eisenhower's support of the Federal-Aid Highway Act of 1956 can be directly attributed to his experiences in 1919 as a participant in the U.S. Army's first Transcontinental Motor Convoy across the United States on the historic Lincoln Highway, which was the first road across America. The highly publicized 1919 convoy was intended, in part, to dramatize the need for better main highways and continued federal aid. The convoy left the Ellipse south of the White House in Washington, D.C., on July 7, 1919, and headed for Gettysburg, Pennsylvania. From there, it followed the Lincoln Highway to San Francisco. Bridges cracked and were rebuilt, vehicles became stuck in mud and equipment broke, but the convoy was greeted warmly by communities across the country. The convoy reached San Francisco on September 6, 1919. The convoy was memorable enough for a young Army officer, 28-year-old Lieutenant Colonel Dwight David Eisenhower, to include a chapter about the trip, titled "Through Darkest America With Truck and Tank," in his book At Ease: Stories I Tell to Friends (Doubleday and Company, Inc., 1967). "The trip had been difficult, tiring and fun," he said. That experience on the Lincoln Highway, plus his observations of the German autobahn network during World War II, convinced him to support construction of the Interstate System when he became president. "The old convoy had started me thinking about good, two-lane highways, but Germany had made me see the wisdom of broader ribbons across the land." His "Grand Plan" for highways, announced in 1954, led to the 1956 legislative breakthrough that created the Highway Trust Fund to accelerate construction of the Interstate System. Eisenhower advocated for the highways for the purpose of national defense. In the event of a ground invasion by a foreign power, the U.S. Army would need good highways to be able to transport troops across the country efficiently. Following completion of the highways the cross-country journey that took the convoy two months in 1919 was cut down to five days. Many limited-access toll highways that had been built prior to the Interstate Highway Act were incorporated into the Interstate system (for example, the Ohio Turnpike carries portions of Interstate 76, I-80 and I-90). For major turnpikes in New York, New Jersey, Pennsylvania, Ohio, Indiana, Illinois, Kansas, Oklahoma, Massachusetts, New Hampshire, Maine and West Virginia, tolls continue to be collected, even though the turnpikes have long since been paid for. The money collected is used for highway maintenance, turnpike improvement projects and states' general funds. (That is not the case in Massachusetts, where the state constitution requires the money be used for transportation.) In addition, there are several major toll bridges and toll tunnels included in the interstate highways, including four bridges in the San Francisco Bay Area, ones linking Delaware with New Jersey, New Jersey with New York, New Jersey with Pennsylvania, the Upper and Lower Peninsulas of Michigan and, in the near future, Kentucky with Indiana. Tolls collected on Interstate Highways remain on I-95, I-94, I-90, I-88, I-87, I-80, I-77, I-76, I-64, I-44, I-294, I-355 and several others. Toll turnpikes in the following states have been declared paid off, and those highways have become standard freeways with the removal of toll barriers: Connecticut (I-95), Kentucky (part of I-65), Maryland (part of I-95), Texas (part of I-30), Virginia (the part of I-95 between Richmond and Petersburg). ↑ Weingroff, Richard F. (Summer 1996). "Federal-Aid Highway Act of 1956, Creating the Interstate System". Public Roads. Federal Highway Administration. 60 (1). Retrieved August 25, 2015. ↑ Federal Highway Administration (September 15, 1999). "Financing Federal-Aid Highways". Federal Highway Administration. FHWA-PL-99-015. Retrieved September 10, 2008.